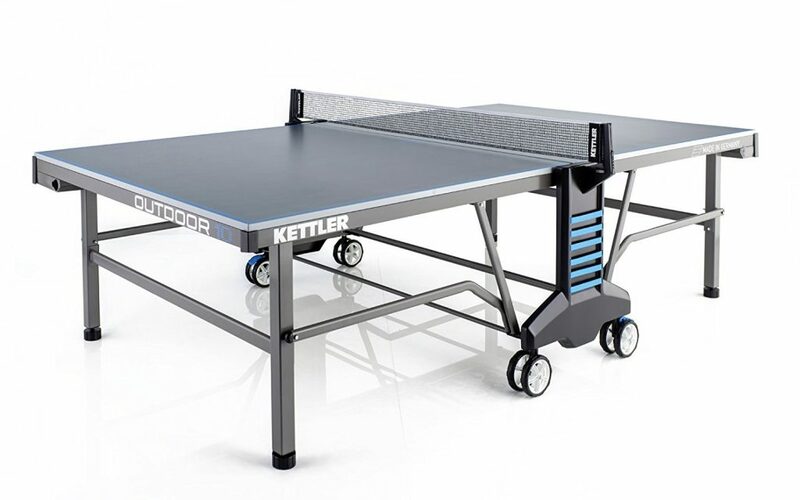 Frame/Design – The Kettler Outdoor 10 weatherproof ping pong table offers things like sealed aluminum composite tournament top and of course you’ll see the ALU-TEC Climate Control on the underside. 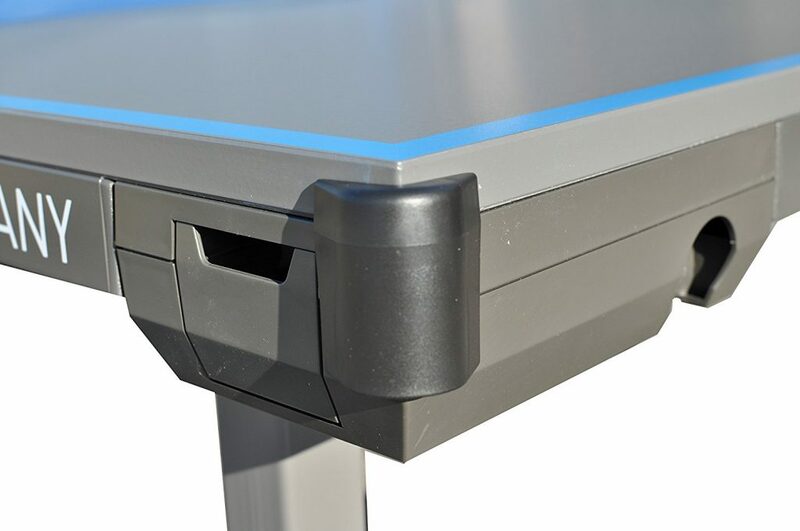 This proprietary design by Kettler means the table can expand and contract due to changes in the weather and not damage the top. Other outdoor table tennis tables have a tendency to warp, but not Kettlers. The aluminum composite top provides a certified true bounce so play on the table is fast and similar to indoor tables. The high impact resin apron that goes around the outer edge of the table not only protects the Kettler from damage, but it helps the top resist warping. The water based topcoat is scratch, fade and UV resistant – this means the table will hold up well outdoors, even in the scorching sun. How about the design? Outdoor tables don’t get much sturdier than this one (only the Cornilleau 510 Outdoor is better in our eyes). 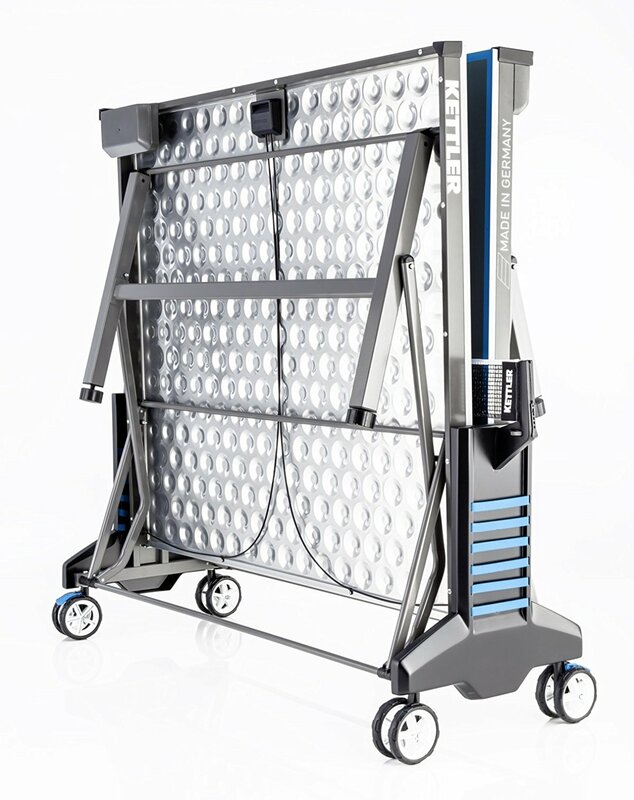 The Kettler features 2 inch square steel legs that are both resistant to scratches and corrosion due to the galvanized treatment and powder coating the table gets during manufacturing. Another nice touch is that the legs have levelers – you no longer have to worry about uneven playing areas like dirt or grass. Just adjust the legs and get that level surface that makes for better ping pong action. There is a ball box for holding extra ping pong balls and a handy dispenser at the tables end. Playability – The weatherproof net is adjustable for tension and height. On the side of the table is an elastic band area for storing racquets or other gear. 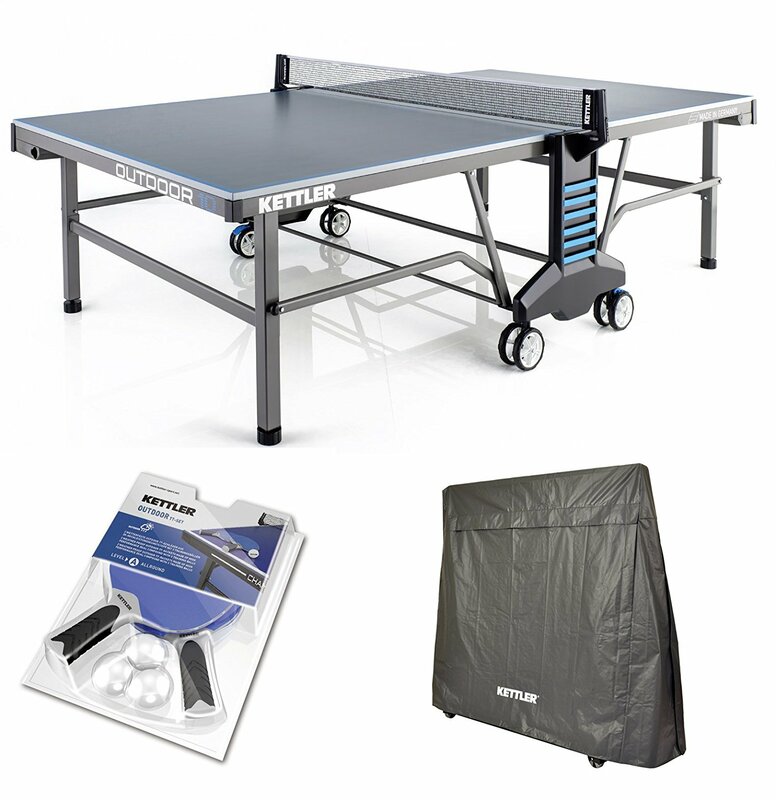 Overall the weatherproof sealed aluminum composite tournament top performs admirably. You get a true bounce no matter where the ball bounces on the playing surface. The tabletop does not resist scuff marks as well as the Cornilleau 500M or 510, but the Kettler Outdoor 10 is very durable. 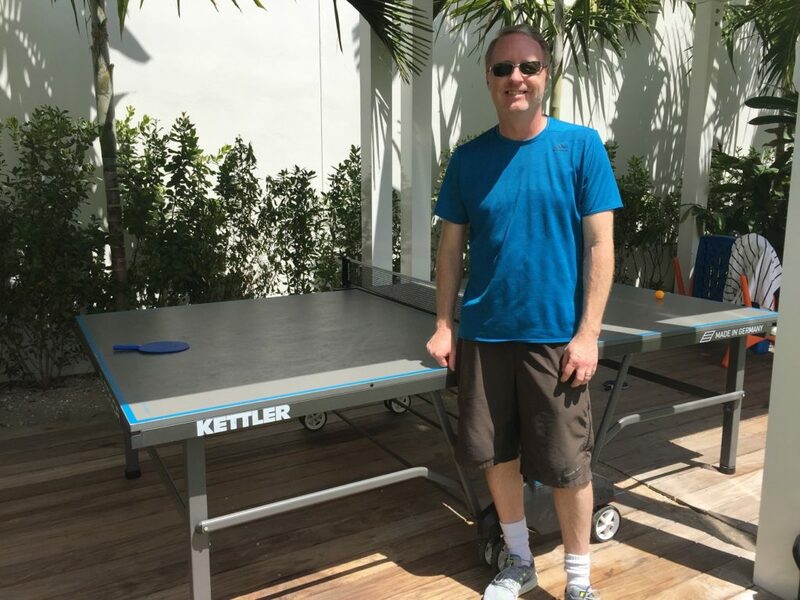 It’s the type of outdoor ping pong table that could be used recreationally as well as in high traffic areas of resorts, schools, on cruise ships, or in office game rooms. Assembly – Assembly is quick – 90 minutes. The video to the right will show you a step by step procedure to get the table up and running as smoothly as possible. Our experience with playing on this table has been excellent and we’ve used it at neighborhood get togethers, company parties, and more. Compared to other tables, assembly is average in terms of time involved. There is one point where you will need a second person to help with lifting the tabletop into position. 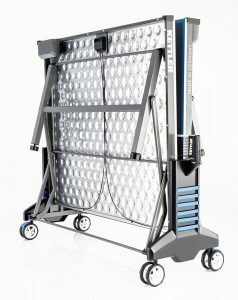 Storage/Moving – The 4 ½ inch dual swiveling heavy duty wheels (see photos below) let you maneuver the Kettler on pavement, grass, dirt, you name it. Two of the wheels have a locking mechanism so once in place the table is sturdy and secure. Playback mode is offered if you need it and the table folds into a compact storage position as well. What we really like on the Outdoor 10 table from Kettler is the single hand locking system – very similar in function to the Cornilleau 500M. It’s easy to use and the cable design is meant for safety. We suggest a cover for the table if it will be stored outdoors for long periods of time with no use. Safety Features – The Kettler Outdoor 10 offers a removable soft-touch edge protector that you can see in the video to the right showing all the features. It’s really creative the way the feature works. The corner pad protects not only the table from getting damaged but it protects players from accidentally banging into a sharp corner when playing. Also, the innovative single hand locking system keeps the table safe for those of all ages when opening and closing it up. The cable system is smooth and easy to use – similar to the way you can close the Cornilleau 500M with one hand. 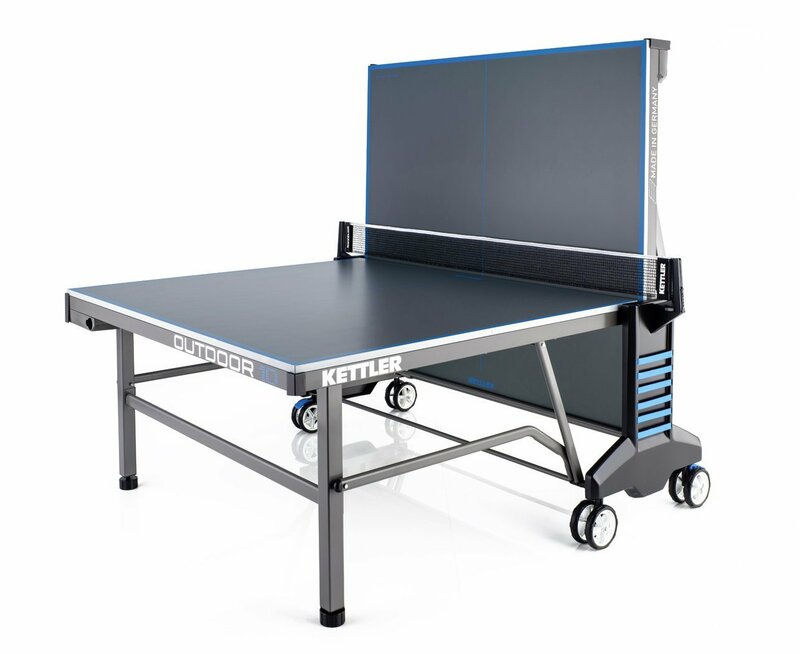 Disadvantages – It’s really hard to find anything wrong with the Kettler Outdoor 10 ping pong table. Sure, you could bring up the price as being a deterrent. It costs about $1500, right around the same price as the Cornilleau 400M, but still below the 500M in price. The wheels could be more heavy duty and the leg levelers could work slightly better, but again we are being overly critical at this point.